I couldn’t fail to be amused. India’s Environment Minister Jayram Ramesh calls for the introduction of a genetically-modified insect-resistant crop plant dubbed the Bt brinjal and the nation goes crazy. First, I owe my global readers an explanation. What is known in Indian English as the brinjal is also known elsewhere as the eggplant and the aubergine. In many of our dozens of languages, we lovingly refer to it as the baingan (pronounced bangin’) or the begun (pronounced begun). Indians have a love-hate relationship with the brinjal. On the one hand, our poets pen lines exhorting Brinjal Kumari. We don’t have Brangelina, we have Brinjalina. The brinjal is India’s most eaten vegetable – shining in bhartas and bhajis and impostors like the tomato are relegated to the second-tier as evident from the moniker vilayati baingan or “foreign brinjal” used to describe the succulent cousin. On the other hand, some of us can’t stand the venerated veggie. Eating poorly chosen or prepared brinjals can cause throats to itch and swell in those with allergies. Some others that aren’t allergic, find the mushy consistency of the cooked product extremely disconcerting. 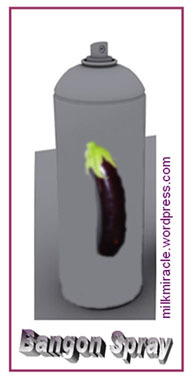 I propose an alternative use for the Bt brinjal. Let’s have farmers grow the crop and then use it to make insect repellents. I’ve even thought of a name for the baingan spray – Bangon. Yes, I know you will all rush out to thank me. Footnote: Incidentally, a research paper published today by Indian scientists led by Dr. Asis Datta of the National Institute of Plant Genome Research in New Delhi describes a genetically-modified tomato strain with increased shelf life; that one barely made a splash in the papers.